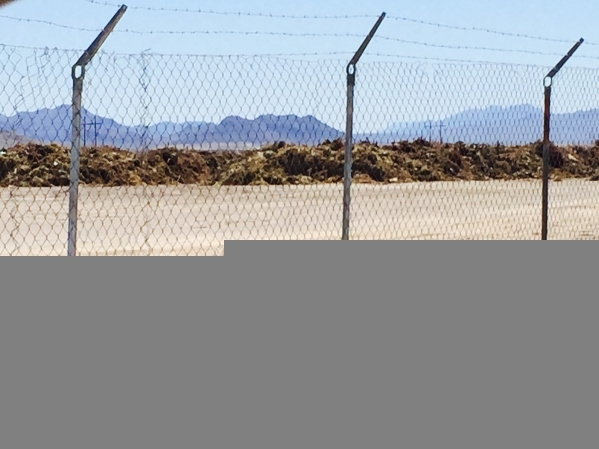 AMARGOSA VALLEY – Amargosa Valley Town Manager Mike Cottingim wants Nye County officials to enforce a county solid waste management violation against land owner Stephen Settlemyer. In a document submitted to the commission July 21, Cottingim claimed that he had seen a Renu Oil truck deposit waste on property located at 2712 East Cook Road in Amargosa on at least three occasions, and asked the board to order Settlemyer to obtain a solid waste permit as he claimed new waste keeps appearing on the site. Cottingim said Renu Oil of America, a Las Vegas-based company that collects waste in southern Nevada was actively soliciting waste. The company didn’t provide a permit to dump solid waste, he said. Cottingim said he had also received several reports of dumping trucks going onto the property. Settlemyer, who attended the Tuesday meeting without his attorney, Dirk Ravenholt, said he had been wanting to postpone his appearance for one week, but couldn’t confirm whether he was on the agenda. Settlemyer was issued an abatement mandate in March after waste build-up on his pig farm was considered a nuisance. He had 30 days to address the issue, but claimed he wasn’t able to do so because of the breakdown of one of his machines. Ravenholt said agricultural operations were exclusive under the Nevada Department of Agriculture and therefore, the board of commissioners had no jurisdiction over the property. “They have to get their permission first before they even file the action,” Ravenholt said. “Clearly, it’s an administrative issue, not a criminal issue,” he said. Commissioner Donna Cox said any violation of the solid waste management chapter would be a misdemeanor and the county is currently in the process of obtaining an administrative warrant for entry, seizure and abatement that would allow to abate the nuisance on the property. Deputy District Attorney Marla Zlotek said Nye County is waiting for the court to either issue the warrant or deny the application for the warrant. If the warrant is issued, a determination will be made whether the abatement of the nuisance requires the securing of quotes or the formal bidding process, she said. Additionally, the Nye County Board of County Commissioners may direct the district attorney’s office to pursue an injunction relief against any violator of Chapter 8.24 of Nye County Code, Zlotek said. To proceed with the enforcement of the code violation, commissioners told Cottingim he would have to go through the district attorney’s office.